Is your engine overheating and you do not know how to repair it find the problem causing the overheating? Then this article is for you. In this article we will go through the most common causes of an overheating car engine. You will also find a guide of how to diagnose the mentioned parts that could cause your overheating. If you are going through this article, I’m sure that you will be able to repair your car without any problems. Let’s Go! The best way to make a proper diagnose for your overheating engine is to understand how a coolant system works. First I will go through some parts and other possible causes you should look into when it comes to overheating. Further down in the article you will find out how to diagnose the parts to replace the right one. The most common causes of engine overheating is a faulty thermostat, faulty CTS sensor, air locks in the coolant system, faulty radiator fan, faulty water pump or a faulty head gasket. You should always diagnose your car properly and do not just replace parts. Take help from a professional mechanic if you are not sure of how to diagnose it properly. A low coolant level will in most cases cause an overheating engine. However, if the coolant has gone low, you do most likely have an internal or external coolant leak on your engine. If the coolant system is working properly, you should never have to refill your coolant because of low level. 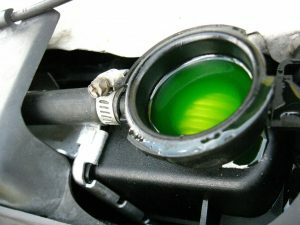 If the coolant has gone low once, you may have to bleed the air out of the coolant system after your refill. A clogged radiator will make the coolant to not flow properly through the engine and may cause an overheating engine. This is not very common and I do recommend to check the other parts first. The radiator is most likely mounted in front of your engine. The thermostat is often located inside the rear coolant hose on the engine, but can often be located on the top coolant hose, depending on the car model. The thermostat should open at 90c when the engine reaches the right temperature to always hold the same temperature when the engine is hot. It’s very common that the thermostat fails so I can recommend checking this one first. The water pump is pumping around the coolant to always keep a flow to make sure all parts are getting cooled and to make sure that the engine is not overheating. Sometimes the water pump is driven by the timing belt and sometimes on the serpentine belt. In some situations, you do also have electric water pumps. 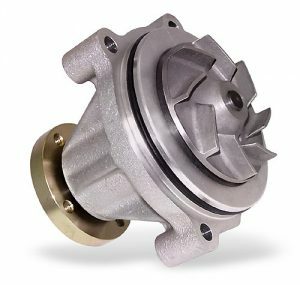 A failed water pump will cause the engine to overheat, and it’s not always very easy to diagnose a failed water pump properly. A failed expansion tank or the cap can also result in overheating if it’s leaking somewhere or is clogged. If the expansion tank is leaking, it may push out coolant and make the air inside the coolant system which causes an overheating engine. The expansion cap does also often have a pressure valve, which makes sure that the coolant system holds a high pressure inside the coolant system, around 1-1.5 bar. Higher pressure raises the boiling temperature and helps the engine to not overheat. A failed cap can lead to too low pressure and result in overheating. 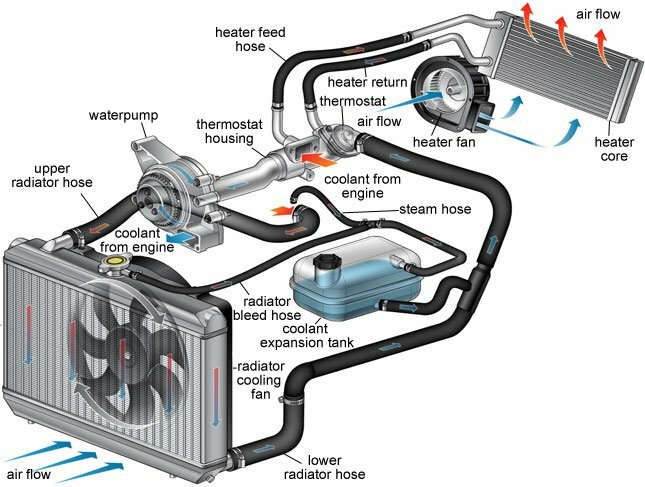 The coolant radiator fan‘s job is to cool down the coolant that is flowing through the radiator. However, while driving at higher speeds, the slipstream is helping to cool down the coolant, and the fan is not needed. But if you are realising that your coolant temperature is raising on idle and on lower speeds, there might be a problem with your coolant fan. A coolant temperature sensor may not cause an overheating engine by itself, but if your car has an electric thermostat or water pump, it may trick them to not work properly. A faulty coolant temperature sensor may also trick you by thinking that your car is overheating but it’s actually not in reality. A blown head gasket can push air/compression into the coolant system, and cause air locks which makes your coolant to overheat. It can also cause engine oil to mix with the coolant and cause a restricted flow. A Blown head gasket is often an expensive repair, as you have to remove the head of the engine. Airlocks in the coolant system are often causing the engine to overheat. However, the air is not getting into the coolant system if you haven’t replaced any parts or have any other faulty parts on the engine. Anyway, it’s a simple step to bleed the air out from the engine to try if it works. If you want to learn more about how to bleed your coolant system. Check out this article: How to bleed air from a car engine. 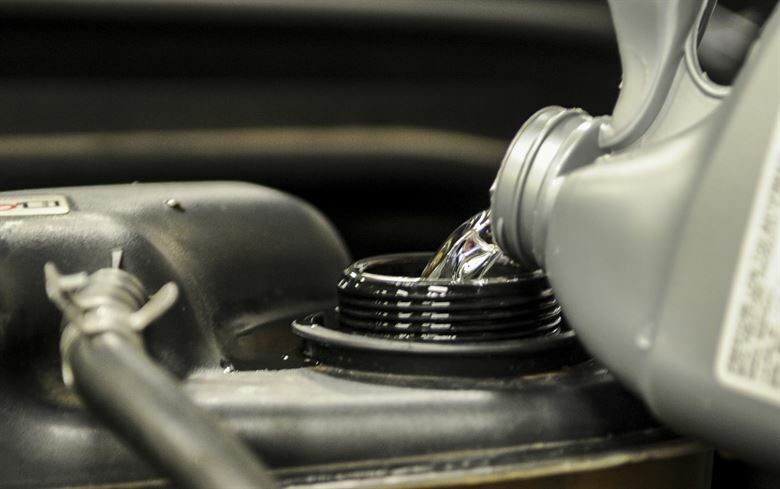 These are the most common parts mentioned in a coolant system. Of course, depending on the car model, there could be more parts included, But these are the most common causes of an engine overheating. Now when we know a bit more about how the coolant system works, it is time to learn how to diagnose these possible causes properly. Here are the things you should be looking for when you are trying to fix your overheating engine. When the car is overheating, you can check if the thermostat has opened or not. To check if it is opening you can feel on the big lower or upper coolant hose, depending on where the thermostat is fitted. If the hose is cold when the engine is overheating and you have tried to bleed the coolant system already, you probably have an issue with your thermostat. In this case, Replace the thermostat. You can also take out your thermostat and put it in a saucepan with hot water to see if it is opening and closing properly. But a new thermostat is not that expensive and it is often much work to remove it. NOTE: Some vehicles are using an electric thermostat, and you should always check the DTC trouble code memory with an OBD2 scanner first for any related trouble codes. If your thermostat was working properly and you could not find any strange temperature drops at the hoses, it’s time to check the radiator fan and make sure it works properly. The most common symptom of a failed radiator fan is that the car is overheating on idle or at lower speeds because at higher speeds the car doesn’t need the use of the radiator fan. You should check if the radiator fan is spinning on full power when the thermostat is fully opened and the car engine is hot or while it’s overheating. If the radiator fan is not working you have to make sure that the temperature sensor for the fan is working and you can also make sure there are no blown fuses. 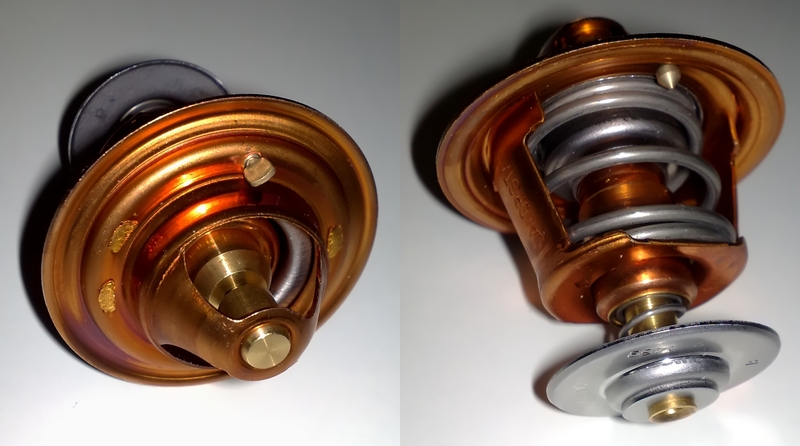 When you have tested or replaced your thermostat and the car is still overheating, it’s time to go to the next step. Now it is time to check if the water pump is flowing any water. It can be really hard to diagnose a water pump without removing it. Some fast checks are to feel on the water pump-axle if you can reach it. Any strange noises? Is the backslash okay? For an example: some Volkswagen engines, the water pump is using a plastic pumping unit, and the water pump is working as usual normally. But when the engine is getting warm the plastic expands and it stops to pump water. It can be really hard to diagnose because you can’t feel anything strange with the water pump. As I said, it can be really hard to diagnose. The only way is to try to see if there is any flow in the hoses or to remove the pump to check. You can also try to check with a small camera if you can reach the inside of the pump with it. If you have checked the water pump and the car is still overheating go to the next step. If your car was just working good for a short time after bleeding the air from the coolant system, but after a while, the same problem came back, there could be your blown head gasket that is pushing compression/air into the coolant system. The easiest way to test this is to see if you get very high pressure inside the coolant system and it’s bubbling out from the cap all the time. You could also go to a car workshop and check if you can lend their exhaust tester. Put the exhaust tester near the coolant cap to see if you get high values of CO there. You can also feel with your sense of smell if you could smell any exhausts inside the expansion tank or the radiator. Another way to see it is to check if the oil and coolant have mixed together, this is a good sign of a blown head gasket. To learn more about blown head gaskets, check out our other article, blown head gasket symptoms. If you got high values and high pressure inside the coolant system very fast: Replace head gasket and check for cracks in the head. Now you have checked almost every part of a coolant system. But the questions is, is the car really overheating or is it the dashboard that is showing you the wrong information? Of course, if the water gets too hot and exploding out through your coolant system, this will not be your case. But if the only thing you have noticed is that the temperature on your dashboard is raising then there could be a problem with the coolant sensor to the dashboard. Some cars are using one temperature sensor for the engine control unit, and another sensor for the dashboard. You have to find out where your dashboard gets your information from. If your car is using one sensor for both the dashboard and the engine control unit, you can check the live data of the sensor with a diagnostic tool. If you have checked the water pump, the thermostat and tried to get the air out from the several times. There could only be one thing left if you have been tested all parts correctly, and that is: The flow in the coolant system has to be restricted or blocked. The problem will most likely be in your radiator or another coolant hose on the coolant system, So I recommend you to begin to check it. If you want you could try to flush your whole coolant system. There could be a lot of stuck dirt inside it, and to try to flush it out could be a good idea because it is really cheap to try and even if it’s not the problem it wont hurt to do it anyways. Now I really hope that your overheating problem is fixed. If it is not then I recommend you to start over with the guide and double check everything. If you tried everything as I mentioned above and the car is still overheating. You can contact us and write a comment down below and we will try to help you out. Explain your problem and explain what solutions you have tried already to make it much easier to give you a reliable and fast answer! Diagnosing parts inside a coolant system is not always that simple without removing them and inspect them with your own eyes. The good thing about this, when you have learned how a coolant system works and what parts are included. You will realise that there is not a lot of different parts that could fail. The coolant system is a really simple construction that is working very well. If your car is using any electrical parts in the coolant system, like an electric thermostat or electric water pump, then you should always read your DTC trouble code memory first to see if the engine control unit is registering any problems. I hope that you learned and enjoyed this article about overheating problems. If you like this article or want us to change or add something, you could comment down below. If this article did not really help you with your fault, then you can post a question to us at our homepage. Write your question as detailed as possible and we will for sure give you a detailed answer.